Balinese Southern Traditional Siamese and Balinese has Siamese and Balinese kittens for sale. My cats are registered with CFA and CFF. Kittens all come with a health guarantee. All my cats are FLV/FIV free. I do not sell kittens with breeding rights. I have a closed cattery and do not breed to outside cats. Balinese are so graceful and elegant, like ballerina dancers that glide so gracefully across the dance floor. That is how the name came about, from the word Bali from the graceful dancers in Bali and from Siam. And thanks to the Siamese, the Balinese was born from a spontaneous mutation of the Siamese gene that produces a Siamese with longer hair, called the long hair gene. The hair is not thick like a Persian or other long haired breeds, but very silky with a very soft thick undercoat and a busy tail as beautiful as a peacock's plumage. The Balinese is more laid back than the short hair Siamese and will take control of your home as effortlessly as the Bali dancers gracefully glide across the floor. Their personality is so sweet and endearing with such a gentleness that would charm anyone that crosses their path. Like the Siamese, they want to be a part of your life in every way, more like a dog than a cat. They love to snuggle under the covers and wake up in the morning, help you make your coffee and help you get the kids off to school. The Balinese is so intelligent and easy to train to walk with a harness and learn to fetch. They love kids and are very gentle with them, even when they are being carried around, dressed up like dolls and put in doll carriages they will be purring loudly. Balinese love their dog companions and will lay curled next to them and groom them just like if they were feline. They love to travel in cars or flying they have no fear and take trips very well. They are very friendly to friends and family that come to your house and do not shy away or run and hide. They will greet anyone that walks through the door with a friendly rub on the leg and a sweet meow. The Balinese is a very intelligent cat, they will look in your eyes when you talk to them like they understand every word and would answer back if they could. They are very good at communicating what they want, they have been known to open doors with their paws and they know your schedule and will be there waiting for you as you get home from work. 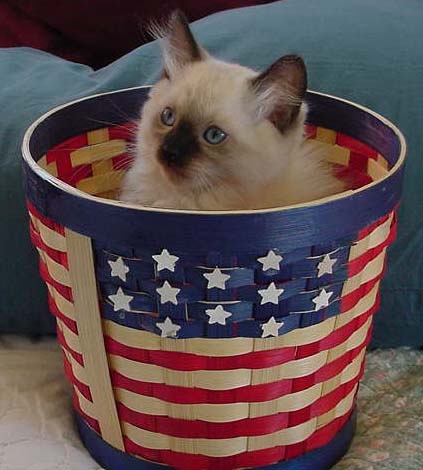 Their meow is not as loud as a Siamese, it is much more gentle sounding and very sweet. They will get their message clearly to you. The Balinese have a deep bond to their human and can sense when you are sad or sick and will cuddle as close as possible around your chest and neck trying to comfort you purring loudly, and will stay by your side until you are better. People that can't have cats because of allergies can tolerate a Balinese. The reason some people are allergic to cats, is because of the protein in their saliva. When a cat licks their fur, the protein drys on the fur and becomes dander. So its the amount of protein in the saliva that cause's the allergic reaction.Balinese have a very low protein in their saliva which has been tested and proven. Some people could still have a allergic reaction, but the symptons will be less severe. So people that are buying the Balinese strcitly because they are "Non- Allergenic" is a ruse of some breeders to get people that are allergic to cats to buy their Balinese. And "Hypoallergenic" means that the cat is less likely to cause any allergic reaction in most people but can still cause symptons that are less severe. So if you or your children have a severe allergy I want to be clear that Balinese can still cause a reaction and all "Hypoallergenic" cats can cause a allergic reaction. Don't fall for all the hype. I want you to buy my Balinese because of their beauty and their silkey fur, and their endearing love they will bring. I love these cats very deeply and I don't want one of my Balinese kittens to go to a shelter and be gased or put to sleep at a vets office becuse you or your child had a allergic reaction. Grooming is very easy with the Balinese and strengthens the bond with their human. I groom my short hair Siamese and the Balinese just about every day because they enjoy it so much. I keep a brush in every room, it is so relaxing when you are watching TV and brushing them and they are so contented. Brushing also activates the oils in the coat and keep it shiny and healthy. Balinese do not shed that much but you do need to brush them 3-4 times a week to get rid of loose hair. They enjoy the brushing so much, as soon as you get the brush they come running. I brush the kittens as they get older so they will be easy to groom in the future, and they love it so much. Over the years I have had Balinese in my litters, just a few born in a litter of short hair Siamese, and they have found a way into my heart. I have decided to breed these regal and breathtaking cats. I have some of the oldest lines of Traditional Siamese in America and these lines run through my Balinese. I will only have a couple Balinese to Balinese litters a year. If you would like to be put on a waiting list, let me know. 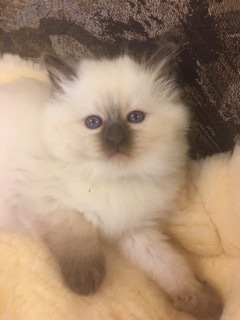 The price of a Balinese kitten is $800-$1200, it depends on color and quality of the kitten. When you get a kitten from me it will be very socialized. I put much time into them and handle them from the first day they are born. It's very imporant to handle them from birth to when they go to their new family to ensure a sweet loving companion cat. Some breeders do not do this and keep them in cages. This produces a very shy and unfriendly cat afraid of their own shadow. The kittens are never in cages and are very healthy and robust, full of life and vitality. To own a Balinese, or should I say to be owned by a Balinese, is an adventure from when you first see your kitten until it grows to adulthood. Balinese can live to their late teens and early 20's. They are a very healthy breed of cat. The Balinese will love you so deeply and be devoted to you. If you have never owned a Balinese, be prepared for a treasure that has fur. These cats will be a part of your life in a big way. The Balinese want as much love back as they give to you. You do have a responsibility to them, they love you so much and believe in you. They will want to be a part of your daily activities and at night time sleep with you. If you prefer a more docile and aloof cat, you need to go with another breed of cat. One of my favorite things about a Balinese is their adorable really long whiskers! It is so cute! And once you look into their little faces, it is pure love. 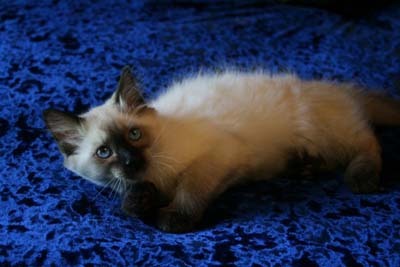 If you are looking for a great companion cat, the Balinese is for you.